When in Venice comes high water Acqua alta from Mediterranean sea isn't a dangerous weather phenomenon. 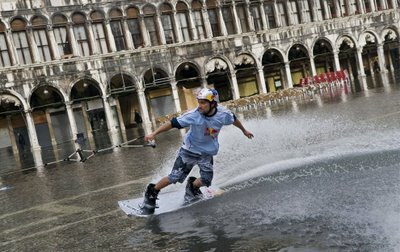 And if I'm going to Venice and I find the high water, what can I do? 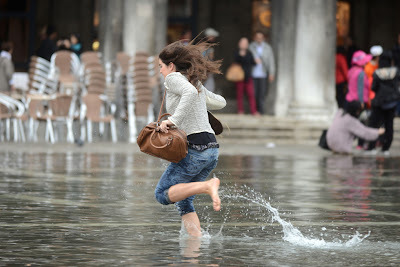 In Venice there are many days during the year when there is the high water, and for various reasons. The inhabitants of Venice are accustomed and well prepared for this event, and tourists are greatly helped. For example, just buy the boots for fishermen, or other gadgets against rain as umbrellas, boots, clothing and anti-rain. 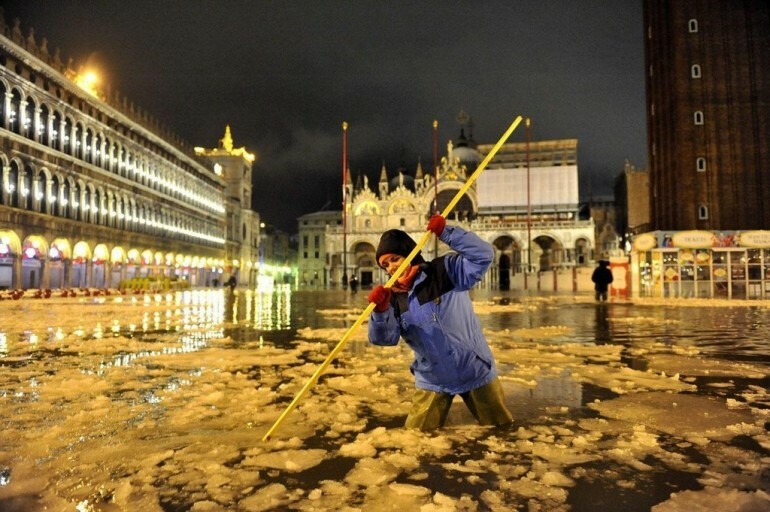 .What's "acqua alta" (high water)? "Acqua alta" (high water) is a phenomenon which generally takes place in Venice in winter time, when a combination of astronomical tide, strong south wind (scirocco) and seiche (see glossary below) can cause a larger inflow of water into the Venetian Lagoon. When does an exceptional tide occur? Exceptional tides (when the water-line is equal to or more than 140 centimetres on the mareographic zero of "Punta della Salute", located near the Salute Church, in front of St. Mark's Square) statistically occur once every 4 years. They are caused by a combination of various factors, such as the astronomical tide, low pressure on the Tyrrhenian Sea, strong south wind (scirocco) and the Adriatic seiche. Further two larger phenomena also contribute to increase the water level: eustasy (see glossary below) and the subsidence of the Venetian Lagoon, which, together, have caused an altimetric loss of about 26 centimetres in the last century.